In the land of Israel 700 ritual baths have been discovered to date. In an article in the Jerusalem Post by Yonatan Adler is this written. Most ritual baths, in Hebrew: mikvaot, are from the time of the Second Temple period. These mikvaot are located in different places: in residences, alongside synagogues, cemeteries and in relation to the Temple complex in Jerusalem. Many of these mikvaot are found near wine presses and olive presses. There is little scientific knowledge about the last mikvaot, which have been found in the vicinity of wine presses and olive presses. The article in the Jerusalem Post is meant to understand more precisely about these mikvaot, built in the vicinity of wine presses and olive presses. There is a possibility that this form of mikvaot has to do with the way of explanation and application of the cleansing and sanctifying laws by the Pharisees in that period of Israel. 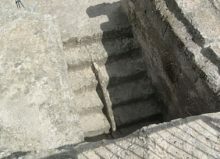 Approximately twenty mikvaot have been found in Israel and these are consisting of stepped water installations and these are located next to wine presses and olive presses. Twenty of these sites are from the Second Temple period. The wine presses and olive presses are so close to this mikvaot that there must be a relationship between them. One of these mikvaot is located in Pisgat Ze’ev, now the largest residential area in the north of Jerusalem. At this archaeological site, besides the wine presses and olive presses, there are also houses whose mosaic floors can still be seen. It may be that the ritual purity of these products had a relationship with the Temple Service and also in the light of the economy of these products in connection with the cleansing and sanctification laws. It is thought that the people who served the olive oil and winepresses first cleansed themselves in the mikvah before they could produce these products. Secondly, there are the food laws and the food offerings (Terumah), which were brought into the Temple and also the tithe of these products for the Levites. The food that was eaten in connection with the Temple Service also had to be clean. There was therefore a trade in these products and no wonder that these mikvaot and wine presses and olive presses were found near the Temple. Recently I visited a archeological site with a wine press, an olive press and a mikvah in the north of Jerusalem, Pizgat Ze’ev. In my imagination I saw the Pilgrims already moving up to the beautiful Temple and in advance they made a stop at this place to buy the clean products for service in the Temple. A short distance away, and the glorious Temple was being seen in the radiant sunlight. In the same radiant light we can also see in our imagination the Mount of Olives where in the near future Messiah Yeshua will stand on his feet. Blessed are you Israel! The Messiah will deliver us!